There was this tune lingering at the back of my head, a song I heard my dad sing when I was little. When he burst into this song, I knew it was a special day marked by great happiness, humour and laughter. In all these years, with so much music coming out of Tibet, I have heard no other Tibetan near or far sing this song. The melody is peculiar, yet so easy to remember. If prompted, I’m confident, I could reproduce it right here and now. 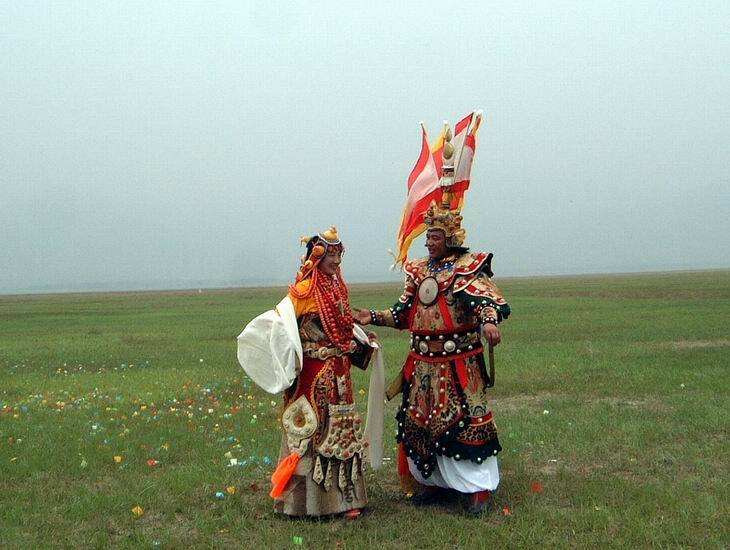 So that’s what my dad’s song was about: the fabled Gesar of Ling, superhero of the Tibetans! Not that I’m too familiar with the epic or anything. The only thing I know about the man is that he fought countless battles and won them all. Boy, if the stories were ever true, those must have been the glory days, when the Tibetans were in control. No offense, brother Riga, but I liked my dad’s interpretation better. You will forgive a daughter for adoring her father. Not only was his voice more powerful, but also when he sang, his whole body would sway to the music with joy while you stand there rather tame and timid. But you do good job! You melodised the song, gave me the words. Now the amorphous tune in my head has a shape. Your song brought back memories of my old man and made me reflect on the story he adored more than any other story in the whole world. My dad always kept a book on his night table – paperback, beige cover with light-bluish frame and in Tibetan script. Neither an aristocrat nor a cleric, he was lucky to belong to a small group of privileged people who received something like a modern education back in old Tibet. But he never went on to make anything out of it. The only books I saw him read were comics, and this Tibetan book at his night table. Either he reread the thing over and over again or he advanced at a snail’s pace because that book lay there for ages: It was the story of Ling Gesar Gyalpo. According to my mom, growing up as a schoolboy in Lhasa with an older brother who was an important Buddhist reincarnate, he had to read the story in hiding. Apparently his teachers didn’t like to see him waste time reading useless stuff. For them, the Tibetan script was holy, taught exclusively with the aim to read Buddhist texts; using it for something as profane as a bellicose novel was a transgression. Gesar glorified violence, they said, and indulging in the story would turn people into Lalos (“barbarians”) and throw them back to the Dark Ages. That’s a pretty extreme standpoint my dad’s teachers were taking. 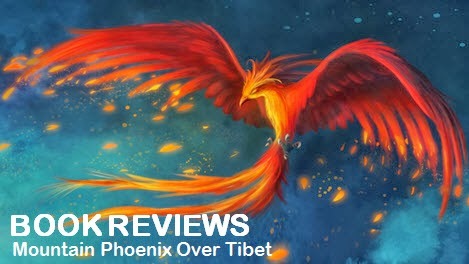 From my viewpoint, Gesar is just a story, what´s all the hype? But in hindsight, limiting the written language to Buddhism must have been the dominant view back then because we’ve never had much in terms of secular literature worth the name. The good news is it's gradually changing for the better. The bad news is change is really very slow. Few years ago at a Tibetan gathering, I heard the Dalai Lama talk about the importance of the Tibetan language and he gave tips to youngsters on how to work on their Tibetan. He said: “If you want to improve your Tibetan, you should read Peja (Buddhist scriptures)”. We can all imagine the youngsters jumping for joy on the inside exclaiming: “Yeah, Peja! Finally! So exciting”! No, seriously, chances that Tibetan kids are eager to improve their grasp of the language by studying religious books are about as promising as telling kids here: “If you really want to improve your English, you should read the Bible”. - An absurd idea. Amazingly though, in the Tibetan context, studying Buddhist texts to improve your literacy doesn’t sound absurd, it is plain common sense. I guess that shows not only do we have a gigantically gaping hole where other countries have a rich, exuberant secular literature, it also shows we’re so used to that huge hole we don’t take notice of it. Maybe that’s also the reason why the Gesar epic is so popular, because that’s all there is, because we simply have no other works worthy to be called a literary tradition? Of course, technically one can learn a lot about the structure of the language and loads of new vocabulary from Pejas, it’s very true. But to be honest, the subject matter is dead boring if you’re not into Dharma. Can you seriously blame anyone if they went for Gesar over Peja or King Arthur over the Bible? I am sure my dad found ways to keep reading Gesar as a boy. He always did what he wanted. Not because he was selfish but because he was someone who thought about things and stuck to his views even when others went the opposite way. Buddha knows we had our disagreements but when I look back, I must concede this is the one redeeming quality that distinguished him from the pack. It’s not an exaggeration when I say he didn’t give a damn. If there were any parallels between his superhero and him, maybe it’s this kind of audacity. After Tibet opened up in the early 1980s he was among the first to return. After each visit, he would bring back books on Gesar. For some reason, which I haven’t understood, the Chinese are very fond of the epic. So my Pala always found enough material. Fittingly, he also enjoyed watching Hollywood movies of the “epic film” genre. He was particularly fond of the ones that played during classical antiquity such as “Ben Hur” or “Quo Vadis”; and he loved war movies like “The Longest Day”, and of course Westerns. 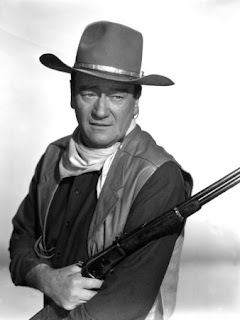 His heroes were actors like John Wayne, Charleton Heston, Charles Bronson, Steve McQueen, and Robert Mitchum. But he always remained a loyal fan of his indigenous Tibetan hero, Gesar of Ling, until his last days. My old man never touched a Peja in all his life, if you ask me. Still I conclude from comments his surviving peers make that his Tibetan didn’t pale in comparison to some of the erudite clerics who used to live in our vicinity. Astonishing for a Tibetan of his generation, that he somehow managed to become “cultured” without cosing up to Buddhism. Assuming Riga and my dad used the same lyrics, I was really surprised to learn from the video that the Gesar song is actually a prayer in the form of a glu (“mountain tune”). Looking at the structure of the Gesar song through my Western lens, it appears to be a tercet with Dactylus as the metrical foot, but no clue if that’s a popular form. The Tibetan folk songs I’ve seen are mostly fourliners with three stanzas and a lot of repeated lines. The Gesar song in contrast has 15 stanzas in total, grouped into 3 parts with five stanzas each and a break after parts one and two and no repeated lines whatsoever. What's the core message of the Gesar song? I am guessing from the ultra-short title mngags.bcol that this is about Gesar being sent down to earth by Buddha (mngags) with the mission to subdue or convert enemies to Buddhism, but I am not sure. At least it would match the content. In the second part, Gesar names his adversaries: the Hor, the Mon, the Djang and another group spelled bdud in Tibetan, which is the way "devil" is written. Except for the Djang, who are still known under the same name to modern Tibetans (Naxi in Chinese with their centre in Lijiang/Yunnan; Tibetan: Sadam), the other names don’t ring a bell. “Hor” is a very unspecific term. It could be anyone “from the north” irrespective of ethnicity or religion. 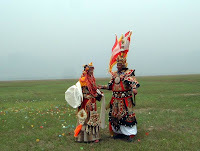 The term is also used to refer to Mongolic groups. “Mon” is not clear either. Since the song locates them in the south, my guess is they were tribal, jungle people on the border to Burma or India (as in the verbal relict “Mon Tamang”?). No idea who is meant by the last group, "devils". Maybe a Muslim group to the West? Gesar defeats all these nobodies but conspicuously there is no mention of the Rgya - the Chinese. If they are also left out in the epic that might explain why the Chinese are so fond of the Gesar: Political reasons. Gesar then continues to awe his enemies by revealing that he is also a great sorcerer, enjoys divine support from his wife who is an emanation of Tara, and receives guidance from another supposedly powerful female, perhaps his Madam Grandmother, called “Manene” (Ma as in “mother”, Nene as in some eastern Tibetan dialects for “granny”, from the Chinese nainai?). In the last part, Gesar lists even more divine helpers such as 80 Mahasiddhas, troops from every Dzong small and large, and so on. This funny enumeration reflects the spirit of the time nicely and what was considered “powerful” back then in that kind of environment. I wonder though, how his battles took place logistically. 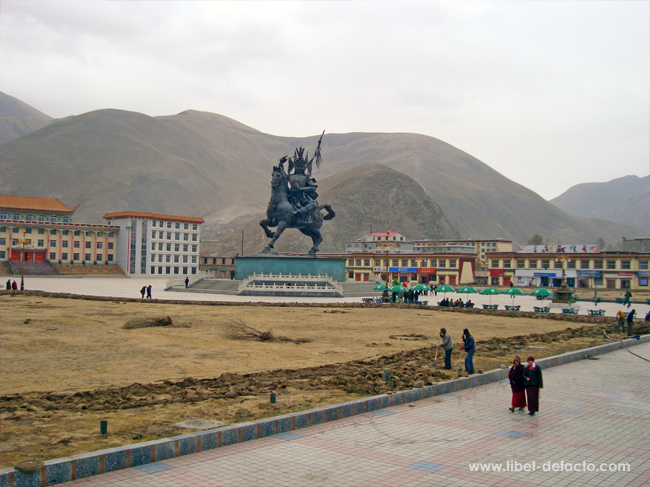 Gesar’s supposed homeland around Dzachukha –Nangchen- Sershul- Kyegu, where northern Kham and western Amdo converge, is basically an empty country - nomad ground. Presuming the man Gesar is historical and his homeland was really in the area of what is present-day Sershul County in the north of the Kardze Prefecture/Sichuan and the Yushul Prefecture/Qinghai, how do we have to imagine that worked? The last stanza wraps up the goal of the song: It’s Gesar’s appeal to follow him: “Hearing this tune is balm for the soul”, he begins (literally he seems to say “it’s caramel for the mind”, very funny), and he goes on to warn the listeners: “Not hearing this tune is none of my business” meaning: If you don’t listen to what I say, you can’t be helped. And the last line goes: “You! Remember Thoepagawa” meaning: Don’t forget what an important person I am, and better believe in the things I teach - or something to that effect. The use of direct speech, imperatives, conditional clauses and waiving of honourific language give the Gesar song a haunting and forceful flavor. There is real drama resonating from the words. Kidding aside, the massive Buddhist overtones in the song come as a surprise. Is this authentic given that Gesar supposedly precedes the advent of Buddhism in Tibet? Is the song perhaps a more recent invention? And how does it compare to the epic in terms of content? Even though personally I’m definitely more into Dharma than fanciful super-hero stories – sorry Pala, another disagreement:--) – the one thing I’ve always adored about the Gesar story was its indigenously Tibetan, heathen origins. I found its non-Buddhist origin thrilling although it’s not clear to me what the pre-Buddhist culture was really like. 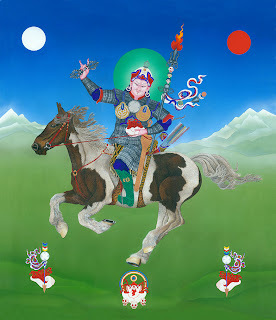 Gesar is one of the very, very few examples I associated with a genuinely Tibetan creation. I am therefore a bit taken aback that the song is so thickly covered with a sugar-sweet Buddhist frosting. Perhaps being Gesar wasn't considered being good enough and so he was turned into a Buddhist God? I would have preferred if they had left him be Gesar, even if that means he was merely a petty tribal king. At least he would have been our petty tribal king. Amalgamating Gesar into Buddhism, making him Padmasambhava, plus Trisong Deutsen, plus a powerful sorcerer, plus a brilliant commander-in-chief, plus giving him a Buddhist deity for a wife, in my eyes is not subtle at all. It’s taking a sledgehammer to crack a nut - plain overkill. As if the Tibetans were ashamed of their own creations as parochial and then clumsily tried to soak everything in Buddhism thinking that would make it "better". Why wasn't the good story left unchanged? In a way it points to the intolerant side of Tibetan Buddhism. Even though outwardly it is portrayed as the creed that promotes peace, tolerance and compassion, inwardly non-conformist elements were simply absorbed. Bon too, seeemd to have shared Gesar’s fate. Bon is said to be Tibet’s original creed but all explanations make Bon sound like a version of Tibetan Buddhism. Today Bon represents one of the five official schools that make up Tibetan Buddhism. It is so completely assimilated into the Buddhist fold that its own adherents could get offended when someone drops a hint at their "unkosher" Buddhists origins. So sad. But it doesn't have to stay that way. Maybe one day, Tibetans will be self-confident enough to welcome a Bon revival movement à la "Back to Roots" without feeling threatened as Buddhists. The tendency to absorb non-conformist elements into Buddhism seems to have a long tradition. Usually we find nothing wrong with it because Buddhism has enriched our culture so much. But it also came at a cost: The way we adopted Buddhism left no space for indigenous Tibetan creativity. We turned the very creed known for its tolerance and compassion into an ideological straightjacket which gave us tunnel vision and in the end also cultural impoverishment: That’s why Tibetans have no secular literature to inherit, few old histories recorded, hardly any accounts from earlier Tibetans, no novels, no biographies, etc. One could say Buddhism spread to many other countries in Asia and everywhere it led to this process of absorption and assimilation of local creeds. But I wonder whether it has been this extreme as in the Tibetan case where it just gobbled up the the entire indigenous culture? Buddhism is really all we have. Take away Buddhism and what is left that would constitute our “Tibetanness”? It’s very sad. It feels as if we sold our souls over the new creed - when that wasn’t required. When you see how Tibetan society responds to new ideas differing from the majority in more recent times, it makes you wonder whether we have become any better over time. What would my dad think of the idea that Buddhism kidnapped his superhero? Maybe he didn’t even care. Maybe he thought it’s still a good story. Maybe he thought Gesar is whatever you believe he is. He is the container of our projections: Whatever you put in comes back smiling at you. At least, that's what I like to believe! So as a gesture of respect for the King of Ling – whether he is divine or not - and as tribute to my old man, I am now going to memorise the lyrics so I will be able to sing the Gesar song to my kids with all due kingliness, just like I heard my dad do many years ago. My grandfather narrated the stories and sang the battle songs to me when I was in my early single digits. It's remained for me one of the few sources of confidence and pride throughout the last 50 years of failure and humiliation for us. I also heard my dad loved reading Gesar back when he was young and growing up in exile. The epic of Ling Gesar was in a way his Harry Porter with music!!! Now in his mid 50s, when I call home he spends most of his free time reading Buddhist scriptures like Prajnaparamita in 8000 words and others. I was also told by my uncles that our neighbor momo-la loved listening to Gesar and she would invite my dad, who was in his teens to read her aloud the epics of Ling Gesar and in turn my dad would get reward. Sad, now we don't have such culture here in the West. We should invite traveling bard from India and Tibet.